Among federal policy makers, it is almost banal to acknowledge that traditional first-time, full-time college students no longer make up the bulk of today’s undergraduates: older students, transfers, veterans and student parents make up a growing proportion of the college-going population. That latter group now comprises one in four college students. But support from the federal government for low-income student parents has lagged, even as their numbers have grown. Before this year, funding for the sole federal program dedicated to assisting them had remained basically flat for a decade and a half. The omnibus spending package passed last month reversed that, marking the first new federal investment in student parents since Congress authorized the Child Care Access Means Parents in School program (CCAMPIS) in 1998. The spending increase – from $15 million to $50 million – was among a slate of new funding for college access and student aid programs. But advocates for the program, who have pushed for boosting CCAMPIS for years, hope the new funding is a signal that Congress is taking seriously the challenges faced by students who care for children while they pursue a degree. “The higher education system does not look like it did when, quite frankly, a lot of folks in Congress were in college,” said Reid Setzer, government affairs director at Young Invincibles, which advocates for policies to make higher education more accessible. 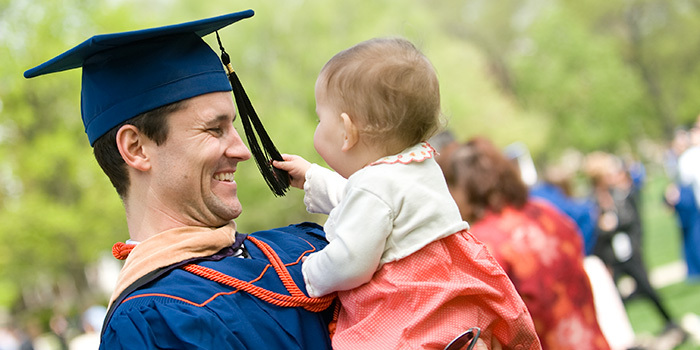 CCAMPIS provides grant awards on four-year cycles to colleges that support childcare on campus. Many also provide coaching on parenting to students and require they meet academic and income requirements to remain in the program. In 2017, the U.S. Department of Education awarded grants to 86 institutions, ranging from $14,000 at Slippery Rock University of Pennsylvania to $427,000 at the University of New Mexico. The average award was about $174,000. The program serves about 5,000 student parents at campuses nationwide. Young Invincibles and the Institute for Women’s Policy Research estimate the new CCAMPIS funding could mean an additional 7,600 student caregivers are served. Demographic data on students who participate in the program is not available from the federal government, but advocates say the group likely resembles low-income student parents over all. Those students are older: the median age of student parents is 30, compared to 22 for low-income students without children. More than half are people of color. And they typically take out higher volumes of student loan debt than do student borrowers without children. New federal student aid data released last year showed that half of student parents who took out a federal loan when they began college in the 2003-04 academic year had defaulted within 12 years. “More than other students, it’s hard for them to persist because of all the different financial demands they experience,” said Lindsey Reichlin Cruse, a senior research associate with the Institute for Women’s Policy Research. The government has not released data on CCAMPIS programs since 2012. But Reichlin Cruse said data collected from individual institutions shows campus childcare helped to double and even triple student parents’ degree-attainment rates. Kimberly Cooley, who graduated from California State University, San Bernardino, in 2016, said if she had not discovered CCAMPIS while attending college in 2012, she likely would have had to put her bachelor’s degree on hold. After initially starting college in 2007, Cooley got serious about earning a degree just as she was expecting her first daughter. After the child was born, Cooley managed to juggle school, work and childcare by attending classes at night. Cooley’s mother, who teaches at a nearby elementary school, would look after her daughter while she went to class and Cooley’s husband was still at work. When the classes she needed were only available during the day, Cooley had to find an alternative arrangement. But the cost of paying for childcare for her infant – about $250 per week – was prohibitive. During her pregnancy, Cooley had heard about the CCAMPIS program from another student. She applied and received a full discount on childcare. Without that support, Cooley and her husband would not be able to afford private childcare, but their combined income was too high to qualify for another government subsidy. The program allowed Cooley to remain in college through the birth of her second daughter while never paying more than 25 percent of the cost of childcare. Cooley is now a handful of courses away from completing an online master’s degree through Grand Canyon University and expects to begin student teaching this fall before starting a career as an elementary school teacher – an outcome she said would not have been possible without the on-campus childcare. IWPR has found that 95 percent of campuses with childcare options have wait lists for that kind of support. That is true even at campuses with CCAMPIS funding. At Pikes Peak Community College in Colorado Springs, Colo., Child Care Services Director Cynthia Neale-Downing said the waiting list ranges from three to 10 students in any given semester. If the college cannot serve students through its childcare program, staffers look for other sources of state or federal funding for those students. In recent years those options have dwindled, however, Neale-Downing said. For those who receive CCAMPIS support, the program has real payoffs, she said. Each semester, the college enrolls about 60 student parents who receive a 70 percent discount on the cost of childcare. For the 68 student parents enrolled during the 2016-17 academic year, five transferred and two withdrew. But the vast majority persisted: 24 graduated and 37 continued with their degrees. In addition to financial support, the childcare center connects those students to other resources on campus to help them succeed, whether that involves tutoring, academic advising or military and veterans’ services. “Everything that our college has in place to help students be successful, we help them find and navigate and get signed up for,” Neale-Downing said. Jennifer Skopal, director of the Children’s Learning Centers at the University of Houston, said their program serves 36 student parents on the campus in a given semester. Those students get discounted childcare and take part in a program called Project Impact to help build healthier relationships with their children. And, importantly, it allows those students to stay on campus longer, Skopal said. “Whether it’s to join study groups or to be in the library to complete projects, it’s really utilizing the extra time that they have here on campus doing things that are going to help them persist in school,” she said. Many colleges will be eager to hear how the Education Department plans to allocate the new money from the omnibus agreement. Typically, grant evaluators rank applications from various institutions using a numerical score. Funding is awarded to the highest-ranked applicants until it runs out. Ninety-nine of the colleges that applied for CCAMPIS grants last year did not have applications funded. That group includes Pikes Peak, which will run out of funding after Sept. 30 without a new grant award. Neale-Downing said she’s hopeful the college’s latest grant application will now get another look. “The unprecedented increase in childcare investments is a clear sign there is bipartisan support to address our nation’s childcare crisis, and I will keep fighting so all parents, including those in college working toward a better life for their children and families, are able to find and afford high-quality childcare,” she said in a statement. The new CCAMPIS funding also fit a theme of new support for childcare services in the omnibus bill. While student aid and college access programs got a boost across the board, support for childcare programs in particular was a big focus. Groups like the Center for Law and Social Policy have highlighted a much bigger spending increase – $2.37 billion – for the Child Care and Development Block Grant. The expansion of the program, though, can also be traced to years of advocacy by organizations like Young Invincibles and IWPR. Those groups said the new funding – the most the program has ever received – is a morale boost for supporters. But they have a long way to go to meet the needs of all student parents. Young Invincibles estimates that about 1.4 million Pell-eligible students have children five years old or younger. Not all of those students would require childcare services, but the group says that number illustrates the scope of support needed from Congress to meet students’ needs. A coalition of groups that work to improve policies for student parents has written to lawmakers asking for $150 million for the CCAMPIS program. That would triple 2018 funding levels but still likely only meet the need of 2 percent of student parents across the country, Reichlin Cruse said. Meeting the total need of those students would likely require billions in new federal spending, she said. “Our goal is to continue to raise this issue and garner support for this population and their needs in a way that can lead to incremental increases,” Reichlin Cruse said.